Look at these questions I’m getting on Isaiah 58… amazing timing! Think we have a book that could help?? I don’t know that I really have anything on the current Isaiah site that has tithes, so they must be finding old articles or tracts. God’s people need such help – it’s like the new birth… the confusion is so great, where do we begin? Are we suppose to give a seed offering every Sunday to the Pastor or Speaker because the word was great and the anointing was great? Why are we giving seed offerings? Without at all wanting to seem frivolous or sarcastic, I humbly would ask you, and the family of God everywhere, the same question. Why are you doing that, dear friend? Jesus does not want you to do that, and certainly not every week. This is going to sound sarcastic, too, but please believe me, that this is from my heart. It sounds to me as if you are being hounded and oppressed for money (“in the name of the Lord”, of course. It always works better that way). That being the case, what the “seed offerings” you are being asked to constantly “sow” can only represent the greed of the people who have taught you. If we give our tithes and offering every Sunday and then they ask for a seed offering every Sunday wont that hurt your congregation? My congregation is grieved that our brothers and sisters in Christ are suffering through such nonsense. Of course it hurts the congregation, and it also hurts the minsters who teach it. The whole body of Christ is in a mess because “truth has perished from the land.” I hope you survive what you are being taught. I know that Jesus loves you; stay very close to him and he will not let you feel bad about refusing to be robbed. I am in the final stages of my new book, “Tithes and Offerings”, and it will answer your questions, and much more. Please stay in touch, and you will know when it comes out. I will send you a copy at no cost to you. May God richly bless you, not the men who are pressuring you to bless them. PS I am adding the following correspondence which I received at the same time I received your welcomed letter. I hope it helps you understand more fully where I am coming from. When relating the two words Tithe and Offering. Does anything other than money (cash) qualify as an offering in the ministry? I know that your tithe is 10% of your gross income. But what I need to know is concerning the offering in the church. Could it also be volunteered time or working in the ministry without pay? It is difficult to respond in clear, simple terms to our brothers and sisters, like yourself, who are still trying to serve God within the corrupt religious system of Christianity. Our words don’t even mean the same thing. To those still inside Christianity, “receiving salvation” means “being born again”, but to us out here in the light, “receiving salvation” means to be judged worthy of eternal life at the Final Judgment. To be a pastor in Christianity does not mean that a man is a pastor in God’s eyes, and to join one of Christianity’s sects has nothing to do, really, with being in Christ. The baptism of the holy ghost, within Christianity, can at best be described as a spare tire, an optional addition to a child of God’s faith, but in God’s kingdom, the baptism of the holy ghost is how one becomes a child of God to begin with. Jesus’ baptism is not a spare tire; it is the whole car. It is the very thing he suffered and died for us to have. Hey guys, how does this sound? The Hebrew seems to me to emphasize that neither Cain nor his offering was acceptable. So, maybe make it “and for his offering”. And so it was, after some days, Cain brought the fruit of the ground, a gift unto the Lord. And Abel, he also brought the firstborn of his sheep, and from the best. And the Lord looked with favor on Abel and his gift. For years I have been wondering about the prophets in the old testament, and the apostles when they were with Jesus, ‘did they have the holy ghost’, and I have been praying about it. 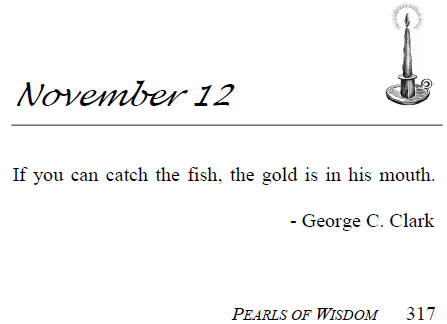 I was going to write to you and ask you for your opinion, but today I found the answer in the Pearl for November 24. I’m so relieved I have the full understanding now. I wish I could thank your dad personally, but I’m going to thank you for holding on to what he taught, so thank you instead! I have been enjoying being in touch with Brad, and Vince a bit, and some others on facebook. Especially, I am learning a lot from Brad on Skype. He has encouraged me a lot to keep going and stick close to Jesus. No one received the Spirit before Jesus paid the price for it. John said “the holy ghost was not yet given because Jesus was not yet glorified” (Jn. 7:35). I am glad that you finally had your question answered. It is an important lesson to learn. I have been following a certain man’s Blogs and recently, I thought I would respond to one. Here is what I sent him. I would like to get your take on it. Thanks. I’ve read many of your blogs, and my heart grieves for your spiritual condition, yet rejoices that you are still seeking! I have wanted to write to you previously, to congratulate you for departing from the confused religious boundaries of the Institution of Christianity and to encourage you to seek after Jesus’ holy Spirit, with all your heart and soul. Now , this current blog has compelled me to write, at last. “Yet this, the highest and most important of all relationships we will ever have, cannot be experienced through those five basic senses. I want to see God with my eyes, hear him with my ears, inhale the aroma of his being, touch him with my hands, and taste his holy kiss. Yet none of this is possible, in this life anyway. This is unfortunate, Bill, that you have not been touched by God deeply enough to experience these things. I have. And I know others, many others, who have been blessed by the holy Ghost in ways that surpass human understanding. I have SEEN Jesus with my eyes. I know others who have, as well. I know of many who have HEARD Jesus’ words in their hearts; and His Word, His prophecy, has come to pass. I know of some who have trustworthy testimonies of actually hearing Jesus with their ears, an AUDIBLE voice, and the things He spoke were true and his prophecies came to pass. I know a man who testified recently of being in the presence of the Lord, in his own home, and he SMELLED the purity of Jesus’ very being, and after enjoying it for a few minutes, it vanished, and the familiar smell of his home returned. I know of another beautiful saint who was physically overwhelmed by the strength and power of God, and FELT His weight upon her, the loving strength of the Lord’s hand held her down in order to demonstrate to her that she needed to depend on Him for everything. We dwell in a spiritual world, BIll, and the more you “wander” and “wonder” about how to find God, the more I fear you will be influenced by many lying and discouraging spirits. You might not ever come to know the sweet Jesus that I have known, if you continue to analyze and intellectualize your spiritual life. I want to encourage you to seek the Jesus of the Bible, and especially His holy Spirit, which is still available to ALL who repent and obey Him with a humble heart, and a thirst for the truth. His truth is simple. His ways are simple and pure, not in any way expressed in the religions of man. Jesus is closer to you right now than your own breath. Ask, seek, knock, and receive His baptism with the Spirit. You’ll know when you do. You will speak in a new language; the evidence of the seal of God upon you. And it shall remove all your doubt, and make you free. Oh well, never mind. . . he deleted our conversation from his blog comments. Cowardly and dishonest, I think. Tell me, is there an “air of superiority” to my letter? I want to be sure my sincerity comes across genuinely and not as if I am conceited in my faith. He accused me of implying he was “a poor, poor guy who didn’t have what I had.” He perceived my letter as condescending. I guess he just doesn’t WANT my God. He just wants to “seek” God. Forever. Those who have found God and are happy about it are a put-down to his ultra-spiritual pride. At the same time, I don’t think you realize how different a person you are and how easily you can be misunderstood. I have even misunderstood you at times. If one Christian wrote to another Christian and said, as you did to Bill, “My heart grieves for your spiritual condition”, that other Christian would not see any love of God in it. He would feel attacked. Or if one Christian lamented that another Christian had, “not been touched by God deeply enough to experience these things,” the other Christian would feel insulted, not informed. And for the most part, such words in the mouths of Christians would be intended as sarcasm. But not from you, and not anyone else who has really experienced the overwhelming light of Jesus that fills us with love for God and for people. When we speak from a heart filled with God’s love for others, it is, as you know, often misunderstood and represented as arrogant and condescending. But it is not. It is meek and it is true. We just want others to know about it, and experience it! How do we confess what Christ has done for us without leaving the wrong impression? Only God can help us with that. Bill just does not know you, Brad. I wish he did. But I am glad that I do. Does this “Pearl” mean that if we have been baptized with the holy ghost we’ll have a changed tongue, as in taming the flesh by what comes out of our mouth? I don’t think that is what Preacher Clark had in mind, but that would apply. His point at the time, I believe, was that if a person has the faith to do what Jesus says, as Peter did when Jesus told him to go catch a fish, the reward for obeying Jesus is in what you get by obeying. In Peter’s case, it was money inside the fish’s mouth, which he and Jesus then used to pay their taxes that year. I just wanted to share an experience I had a little while back. I am in a rock climbing class at school, (there is an artificial wall in the gym so we do most of our climbing inside) for one of our activities we went on a Sunday rip to a local outdoor wall. I think its the only one for 200 miles. The climbing was much different from what I was used to. As I was climbing, I got to a point where I had no hand holds, I couldn’t go any higher. I started feeling around for whatever I could find. Eventually my hand came to rest on a tiny ledge, I could only fit about half of my finger tip on it. I thought, ” Well that’s not going to work”. Then I heard God say “Strengthen the hold and trust it”. To strengthen a hold means to put your thumb on top of your fingers. I did, and as I put my weight on it I found that it was one of the most stable holds I have ever had. I didn’t even realize what happened till I got to the bottom, when I did I thanked God for what he had done. It is amazing how much he cares. When I was growing up I got the impression that God takes care of the big stuff but leaves the small things to… I don’t know, chance I guess. It is amazing that I get to learn first hand that that isn’t true, to see how much God loves his children. Well I just wanted to share. As far as school goes, it looks like I will be able to do the medieval studies major with a classical studies minor. I might even be able to get a double major in history, but that is secondary. Solomon had so much wisdom given to him from God yet in the end he sinned against God by marrying foreign woman and worshipping other gods. How come his wisdom didn’t stop him or warn him of the danger of doing this? Did he think he was so wise that he could escape the wrath of God? I am so confused how he could be so wise yet so vunderable. Is lust of the flesh stronger than the wisdom given from God? “God forbid” One more question, Is it because he did not have the holy ghost that he was not able fight the temptation of the flesh? Thank you Pastor John for your dedication to delivering God’s word to the people. Solomon himself wrote, “There is no wisdom, or counsel, or understanding against the Lord.” What that tells us is that no matter what any man’s gifts are, if he “turns from the holy commandment given to him”, he will be destroyed. Regardless of how much wisdom Solomon had, he had to obey God, or his own wisdom would be turned against him. Solomon had some weeds in his character that he did not chop out of his garden, and in time, they grew so much that they overrode his devotion to God. That’s a warning to all of us.